I planned on doing this post for a few weeks and I still forgot my after picture on Thanksgiving guys but thank goodness I had 2 Thanksgivings this year. These posts were already put on my Instagram and Facebook. I wanted to share them with my Blog people though. This is me. How do I look? Happy? Sad? In pain? Lonely? Depressed? Fatigued? I actually look like I have it all together in this pic except I am in sweats in bed and 20 minutes late. I am struggling guys. I have a UTI that I have been fighting for over a week and now (TMI) a girlie infection from that. My body is so over it and I started a flare yesterday. Everything hurts. And I mean everything. My hair. My eyelashes. Everything. I only slept like 4 hours last night so I am emotionally shot too. I am struggling. I need to get vertical. I need to go socialize and talk and eat and have a good time. But I am struggling. How do you guys handle it when you have a big occasion and you have a big flare? Give me some tips. I think I will eat pie. What I did was sit on the couch on my heating pads and try not to cry until food was ready and then after we ate I sat on couch for 30 minutes and I was out of there and home to die. I forgot my after picture because I was in no shape to take one. I slept forever and woke up feeling decent and my boy dragged me out shopping on Black Friday. Then brought the grandbaby home with me to nap. My friend came over to put up my Christmas which I watched her and the grandbaby do and then I got ready and we went to Thanksgiving #2. A busy but not crazy day. Here is post 2. T his is the effects of a 2.5 hour party. Not really a party. Low key dinner with family. I didn’t even have to cook or clean. Just sit around playing with the grandbaby and visiting. I had a great time. I had been looking forward to it all week. Then I came home and the moment I laid on the bed it all hit me. Exhaustion, pain, headache, that bone deep weariness. I slept roughly 10 hours. I guess I don’t know what kept me going but we spoonies need to come up with a name for it. That thing that gets you through the holiday dinner or birthday party. That thing that let’s you answer “Fine!” So many times when you aren’t fine. That thing I just can’t put my finger on. Is it just sheer power of will? Is it determination? I don’t know. What do you guys think it is? Is it more than one thing? Is it different things on different days? Tell me what you think! I wish I had taken a picture after the first one only because it was a more dramatic after shot but you can see the difference I think in the second set of pictures. I don’t think people without chronic illnesses realize just how much it takes out of us to do normal things. We tend to cover it up by saying we are fine or we are just tired and pasting on a smile. If we want them to understand we have to let them see. What do you guys think? Comment on this posting and tell me what you think. The second post got a good response on Instagram. 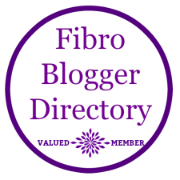 Follow me @fibroscoop to join the conversation. Saw it reposted. Thank you!